Shenzhen, China – August 15, 2018 – Huawei Consumer Business Group (CBG) today received an award from the European Image and Sound Association (EISA), a group comprising 55 of the world's most respected consumer electronics magazines. 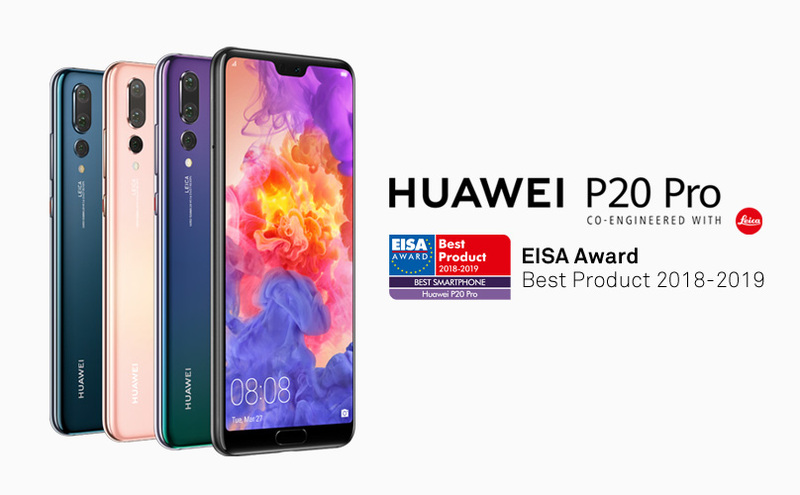 The HUAWEI P20 Pro was named "EISA Best Smartphone 2018 - 2019" by the association in recognition of Huawei's commitment to quality, design and performance, as well as the company's long track record of introducing stylish, powerful and winning devices. This is the sixth consecutive year that Huawei has been recognised by the EISA. The revolutionary Leica Triple Camera on HUAWEI P20 Pro boasts the highest total pixel count among all smartphone cameras on the market today. In addition, it supports 3x optical zoom and 5x hybrid zoom, plus innovative features including HUAWEI AIS (AI image stabilisation). The sleek design of the HUAWEI P20 Pro features barely-there bezels and all-new gradient colours. Thanks to the world's first AI-powered chipset, the phone delivers a fast and smooth user experience. The premier camera features allow for a superb low-light photography experience, making it one of the few devices capable of shooting long-exposure photos clearly without a tripod, owing to Huawei's proprietary AIS technology. In addition, the 4,000 mAh battery puts the HUAWEI P20 Pro among the smartphones with the largest battery capacities. Taken together, the HUAWEI P20 Pro represents "a winning combination of great hardware, optics and craftsmanship," noted EISA. "With its dazzling glass finish, impressive 6.1 in, 1080 x 2240 px resolution AMOLED screen, 18:9 ratio, dependable 4,000 mAh battery equipped with Super Charge functionality and – last but not least – amazing triple camera system on its back, co-produced by Leica, the HUAWEI P20 Pro is the most advanced, innovative and technically superior smartphone ever. The perfect companion for mobile users, it is also a trendsetter in the mobile photography field due to the stunning photos and videos it produces. The core imaging technology includes a primary 40-megapixel F/1.8 colour sensor, combined with two secondary sensors – a black and white 20-megapixel F/1.8 and 8-megapixel ultra-zoom F/2.4 for colour. It's a winning combination of great hardware, optics and craftsmanship."